In today's world, communication is everything. People non-stop have e-mails coming in, phone calls, faxes - you're always in contact. Information is everywhere, and it's spread out even more. The Parafone module pairs communication with your information, letting you just tap on a number in your address book to make a call. Or in the same device take notes, while on the phone. It's an idea that's already making its way in the wireless market. 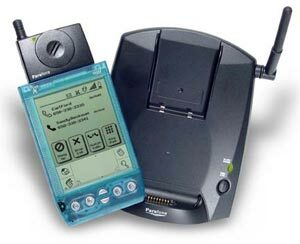 The VisorPhone, the Kyocera Smart phone, Microsoft's Stinger - are all methods to pair your information to communication. The Parafone does this, but instead of on the go, it does it in the comfort of your living room. For $119, you get an Analog 900 MHz cordless phone, a replacement cradle/base station (powered by a included AC adaptor), and a standard clip-over-the-ear headset. Even though many good decisions were made in the development of this product, there are some that weren't, and in some ways, it can outweigh the benefits of bridging information with communication. Dimensions: Handset module 94mm×8mm×29mm approx., Base 164mm×130mm×106mm approx.